You can reach Tavarnuzze by leaving Florence along Via Senese from Porta Romana and continuing straight on after Galluzzo. The town has about 6,000 inhabitants with the more recent buildings in the centre and the oldest houses up on the hill of Montebuoni. It is mainly modern in appearance but there are a number of ancient churches in the vicinity. 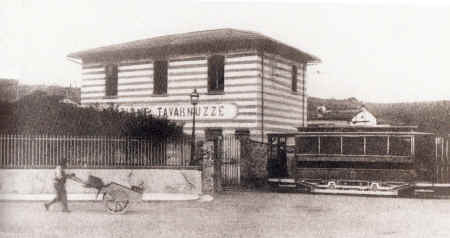 Steam tram in Tavarnuzze at the turn of the 19 C, and the later electric tram. The origins of Tavarnuzze go far back into the past and its name probably indicates that several small inns once stood here, as it was a busy transit point up until the early Middle Ages. From the centre of Tavarnuzze, you can start the climb up the steep hill of Montebuoni, the ancient Roman road that then descends down to the bridge at Scopeti. Just before you reach the top of the hill, you come to the facade of the Spedale of San Giuliano, which gave shelter to famished pilgrims otherwise without a roof over their heads. The building apparently once belonged to the Vallombrosian Order of Montescalari. The Spedale lost much of its importance in the 17 C because most of the passing traffic began to use the new Cassia road below. Holiday rentals in Tuscany near Tavarnuzze. Click here for places to stay and things to see in Chianti. The famous Castle of the Buondelmonti, whose traces are limited today to just a few stones, once stood on the top of the hill. A legend tells the story of how the family came to live here. Apparently a daughter of the Marquises of Saluzzo gave birth to a pair of twin boys here after having run away from home because she was unmarried. Buondelmonte and Scolaio's descendents settled here and, thanks to this sorry event, the place was thereafter called "bad woman" - muliere mala. 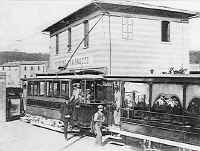 However the Scolari, a branch of the family, soon moved away to another area. Adrian IV's bull of 1156 mentioned the church as a suffragan of the parish of Santa Maria at Impruneta under the name of San Pietro "de muliere mala". It was called simply San Pietro at Montebuoni during the tenth pontificate (1276-77) when it had to pay the papacy a tax of three lira, half the amount the Ospedale paid, so it must have been a rather small and impoverished church at the time. Apparently the Buondelmonti were as fearless as they were greedy for riches and power, seeking the protection of the monasteries to obtain their ends. Their most important protectorate was always over the Parish Church of Impruneta and the Church of Montebuoni. Meanwhile however the Florentine Republic did not approve of the fact that that its commercial trading with Siena, a republic that was becoming steadily more dangerous to the city, was controlled by the tolls exacted by the Buondelmonti family and, although Ranieri placed himself under the protection of the Bishop of Florence, the Florentine Republic razed the castle to the ground in 1135 and the Buondelmonti moved down to live in the city, first in Borgo Santo Apostoli and later in Piazza Santa Trinita. An oratory was built on the site and can still be seen today. 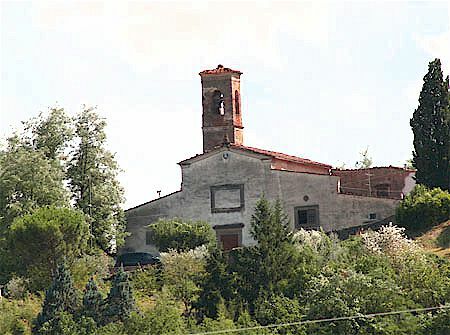 The Church of San Pietro a Montebuoni, mentioned in 1156, supported by the Buondelmonti, later by the Captains of the Parties and lastly by the Grand Duke himself, had jurisdiction over several villages as far as Scopeti, on the other side of the river Greve. San Pietro was almost certainly reconstructed in the 14 C, though its original design was very different from that of today as it has since undergone many alterations. It contains a panel of the Virgin and Child by an anonymous painter with obvious influences from the school of Giotto. The church became a priory in 1518 and several improvements were carried out during the centuries that followed, among them the baptismal font which gave added importance to the little church because the children of worshippers from the surrounding churches were brought here to be baptised. A place called the Mill of the Devil can still be found in the valley at the bottom of the hill of Montebuoni, along the banks of the river Greve. According to a legend, the daughter of the owners of the mill - which was first the property of the Certosa, the Rossi and then the Grifoni families - was so ugly that she frightened away anyone who happened to pass by there. The Palazzaccio, which stands beside a small group of houses, was probably a guard station for the Castle of the Buondelmonti. On your way back towards Florence from Tavarnuzze, you can take a small and ancient road near the entrance to the motorway at the Certosa, which takes you through Le Rose, Baruffi and Quintole to Impruneta. These churches are located just outside Tavarnuzze, near the motorway exit. The Church of San Miniato at Quintole is elegant and severe in its architectural design, and can be reached along a dirt road. The 14 C interior is in the form of a Latin cross with fragments of frescoes of the same date. San Lorenzo alle Rose is even more of a treasure, even though it was reconstructed in the early 14 C. It is mentioned in documents from as early as the 11 C (at Camaldoli for example in 1120). The bare simplicity of the facade and the outer stone walls of the sloping roofed structure show clear traces of the original 14 C building. The interior not only contains paintings by Ridolfo del Ghirlandaio and Andrea Boscoli but also a unique work of art, a Madonna and Child that is now generally accepted as by Taddeo Gaddi (1320-1366), true heir of the school of Giotto. The original name of this church was San Pietro in Jerusalem (hence Gersolè). The Gherardini, an ancient Florentine family who owned many estates in this area, commissioned the building of it around the XIII century, as can be deduced both from the architectural structure and from the materials used in the back wall. It has a Romanesque plan. On the wall of the transept there are paintings of the 17 C and the “Via Crucis” by Luigi Sabatelli. The church, restored in the 19 C, has a characteristic position on a hill. For detailed information about this area of Tuscany, visit our Impruneta web site. Tavarnuzze © ammonet InfoTech 2005 - 2018. All rights reserved.